The new Spec cover stock on the Storm Crux Prime is the next significant advancement in bowling ball technology. This isn’t an overstatement. I have 10+ games on this ball already and there is no hint of lane shine or oil saturation. The ball is still reading the lanes as well as it did off the press. So far, this ball performs as expected. I went with my favorite 3 ¼ x 6 ¼ x 2 ½ layout. No trick layouts. I want to see the full potential. Now, if you’re looking for some big hook monster that’ll go gutter to gutter on a lake of oil, let me manage your expectations. I tested this on a higher volume house shot. If you want this ball to put up some big numbers, here’s what you need to expect. The Crux Prime is going to dig in on the front part of the lane and give you a mid-lane shape you’re otherwise not going to get with a pearl or polished ball. This ball will NOT give you that “hockey stick” shape path. It does it’s damage by controlling the pattern, holding energy, and driving through the pins. Who should throw this ball? Well… everyone should… but here’s who I think it’s going to help most. Speed dominant players (me) on high volume flat patterns. Lower rev players on longer or wider house shots. High rev players, you’re probably going to see a weaker backend reaction than you’re hoping for on a house pattern. If there’s a hint of early friction, you’ll see that typical deflection through the rack. This ball is a great tournament, challenge, or sport shot ball for you. It’s early, but I am incredibly impressed with the new Spec cover stock technology. This is a game changer for sure! If you were a fan of the Alpha Crux… you should order this ball now. I had the opportunity to test out 2 different layouts with the new Crux Prime; one pin down and one pin up. The layout for the pin down is 50 x 3 3/4 x 75 and the pin up is 45 x 4 x 30. I really liked both layouts on these balls as it will provide added versatility to my arsenal. I tried the pin down first as that will be my benchmark layout on the fresh oil patterns. This provided a very early controllable read of the lane to help blend out the pattern. Thereafter, I went to the pin up when I needed the ball to save energy and kind of float a little bit through the fronts and provide energy and angle down lane. You can see the comparison of how energy is spent by watching the video and comparisons between the shots. Another component that I really liked about this ball is how long I was able to stay in it without making a ball change. Typically, I use asymmetrical balls for the first game or 2 then ball down to something weaker and more angular. With the Crux Prime I will be able to stay in it a lot longer than 2 games. This is attributed to the new coverstock, SPEC, which is designed to maintain energy down lane without burning up too early. For those who loved the original Crux's or is looking for their next strong asymmetrical solid the Crux Prime will be an excellent choice to add to your bag. The Storm Crux Prime utilizes the Catalyst Core and the new SPEC (Storm Performance Enhancing Coverstock) coverstock. The goal with the Crux Prime was to design a high-performance bowling ball that can hold up to the wear and tear of lane friction and prevent oil absorption. Storm's design team did exactly what the intended. The Storm Crux Prime will definitely hook. The ball reaction was a strong, continuous hook. I compared it to my Alpha Crux with 2000 surface and ended up 3 and 2 left with the Crux Prime. The Alpha Crux was a little more angular, which is also true for my PhysiX. The Crux Prime will be a first ball option in a lot of tournaments, especially for the speed-dominant players. Actually, the Crux Prime is working well for a lot of different styles of bowlers. I drilled up a Crux Prime for our fresh league shot. I chose this layout because of my high axis tilt and need a ball to help me read the fresh oil better. I have one more that will be drilled that will be used for tournaments. So far I am really liking what this ball gives me down the lane. I am able move my feet left during the 4 game set without losing carry. I used this ball during our Wednesday scratch league and had a good look the first game and a half when playing just inside 2nd arrow out to 7/8. As the lanes transitioned I moved into my “weak 10 zone” that I see with some of my other equipment. This is where the Crux Prime really shined! I continued to carry the deeper I got, which for me is not that usual. Overall, I am liking what this ball is giving me to start the night and end the night. It is not jerky down lane when it hits the dry. It is smooth in the front part of the lanes and gives a good back end motion down the lane. I can’t wait to see what this ball will give me with tournaments! Hey all, this is storm staffer Josh Shoemaker bringing you another ball review video for the Storm crux prime. The crux prime features the same catalyst core found in the alpha crux and crux pearl, but is now wrapped in an all new solid cover featuring SPEC technology. When examining the design intent for SPEC, you can see that the cover is designed to maximize durability and longevity. While initially bowling with the ball, you can immediately tell that whatever surface you put on the ball seems to last longer than normal. Whereas it’s impossible to avoid lane shine all together, SPEC truly does maintain the maximum amount of friction to the lane as possible for an increased amount of time. For this review video, I decided to bowl on a fairly flat 44’ sport shot. For me personally, the crux prime will fit at the top end of my bag, used primarily as a ball for fresh tournament conditions. My immediate impressions of the crux prime were nothing short of spectacular. The ball really does form as suitable replacement for the alpha crux, where I truly believed we had a gap in the line for some time since the discontinuing of the alpha. The crux prime is extremely early, round and continuous making controlling the pocket on this moderately difficult pattern a breeze. When thrown next to the alpha, you can see that the prime forces me just a touch farther left due to it being slightly slower to respond to friction than the alpha. The physix however is a step down in terms of reaction, being much cleaner and quicker downlane. On this particular pattern, I was forced much farther left with the physix due to how much faster it is down lane. Make sure to visit your local VIP pro shop to purchase your very own crux prime today! The Crux Prime features the return of the Catalyst core from the original Crux series, and a new cover called SPEC. The benefits of SPEC are greatly increased durability and longevity due to a nearly non existent oil absorption rate. Another feature is an improved friction response, unlike other heavier oil balls that can lose energy and burn up on friction, SPEC actually increases its entry angle on friction, so no matter what kind of condition you’re on, burning up and quitting isn’t something the Prime is going to do. It IS however very smooth, it blends wet/dry very well and is slower on friction, so it’s very consistent and predictable and seems for me to ignore the pattern more and offer a truer read than other balls, but that’s at the expense of a more typical and familiar long and strong resin reaction. It is speed sensitive due to the slow response to friction, so higher speed/lower rev combos will likely not get along with it well, and it’s not backend in a box, but personally I’m a huge fan, I haven’t put it down, and I’ve heard nothing but positives from everyone I’ve talked to. luke you made me feel better about passing on it with your comment about higher speed/low rev players won't like it as much. i have been on the fence about what high end ball i was going to get for sport. i ended up with the halo pearl as i've been having issues creating some angles into the pocket. but the consistency of the crux prime kept bringing me back to it. i ended up getting the halo pearl though. - Very strong, continuous, but controllable. - Despite being a heavy-oil ball, it can hold its own on a wide variety of patterns. The Catalyst core was one of my favorite engines that Storm has ever released; the Crux Pearl was a backend monster and the Alpha Crux was a beast on heavy and sport conditions--so much so that I still see a few in tournament bowlers' arsenals three years after its release. Needless to say I was excited to hear that Storm was bringing back this great core. What's different about this version of the Crux is the new solid cover called SPEC (Storm Performance Enhanced Coverstock). The intent of this cover is to not only create unparalleled "dig" and power as it encounters friction, but is designed for longevity and consistency over time. Out of the box I immediately noticed the strength of this ball. I used this on a higher-volume, longer house shot than I'm used to, but I was 8 boards left with my feet and 5 boards left at the arrows than I normally start out at on the more dry house pattern that I'm accustomed to. Using this line (4th arrow out to 9 board on the fresh) I had 300 straight out of the box. As the lane started to transition, I was able to keep migrating left without losing any hitting power. The next day I bowled at my drier house for league. While I did start 3 and 2 further left with a breakpoint of 8, the ball crushed the pocket with a ton of power shot after shot. The lanes really dried up as the night went on, forcing me to get in front of the ball return and get inside 5th arrow. Unlike most solid covers that burn up and leave endless 10-pins from this angle, the 10 was either knocked straight off or slapped silly by the 6 pin, even as the night ended. 751 with it even on tons of friction. So despite being described as a heavy-oil ball, which it is, it can be used on the drier shots as well with striking results. It's safe to say that Storm really delivered a winner with this beast. Stop by your local Storm pro shop and pick one up today! Likes: Doesn't shine up after being used!!!!!!!! The New Crux Prime is a huge success!!!! If you were a fan of the original Crux then you will love this ball!! The new SPECTO cover is absolutely amazing. The one constant issue I have with all our solid covers is that the balls get a lot of game shine very quickly, causing me to have to continuously hit the covers with abralon pads regularly to keep them at the surface I like. With the new SPECTO technology I haven't had to do it 1 time yet on the Crux Prime. Generally I would start to see game shine develop on balls after about 5 games or so depending on the volume of oil. I am already closing in on the 15 game mark with the Crux Prime and it still looks the same as it did when I drilled it and for me that is a huge check in the pros column!!! I used my normal 65*4.75*35 layout on it, this layout is on my physix and code X and was also on my first Crux. Compared to the other asym balls that I have this ball is like the best of both worlds when it comes to how quickly it reads the lane and how much continuation it gives me through the pins. Its alittle sooner than the Physix and doesn't have quite as much continuation down lane but its not near as early as my SureLock and Code X and gives me significant more continuation than both of those. I typically don't like using big asym balls on league patterns because they force me way too far left for what I prefer to play and my angles are much tighter because the strong cores want to slow down too much but this Crux Prime didn't mind seeing the friction at all. I had no problem chasing the oil left and still being able to get the ball away from me with great drive through the pins. This ball will be a must for any tournament bowler for longer patterns and the league bowler that sees a heavier volume in their house shot. If you know me and my ball reviews, you know I do not like to make blanket statements about bowling balls… BUT… the Crux Prime is THE BEST BOWLING BALL ON THE MARKET. Period! It is “Virtual Gravity” and “Cell” good! The Prime uses the proven Catalyst Core that has been in all of the Crux ball of the past, and to this day bowlers on the PBA Tour as still throwing the Alpha Crux even though it’s been discontinued for over a year. What makes the Crux Prime really SPECial is the new SPEC coverstock. I don’t know the science behind what makes this cover so good but all I know is that it creates a ball motion that I have never had in my bag before. I have mine earlier and stronger than a Sure Lock, but it has more shape than a Halo and way stronger than a Code X. It is the strongest coverstock that Storm makes but somehow doesn’t read at the foul line and quit like you would expect a super strong cover to do. 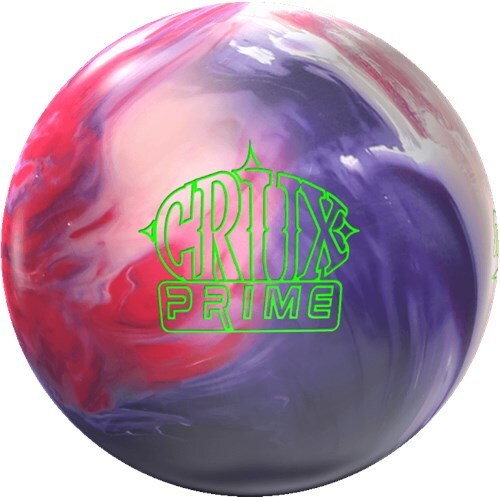 The only thing I don’t like about the Prime is the color scheme (I hate bowling balls with white in them) … but outside of that, this ball continues to give me a look that I cannot get with any other balls in my bag! The new Premiere Line ball, the Crux Prime is going to be a hit for anyone that sees medium heavy-heavy oil lane conditions. Strength----I compare it to the Sure Lock. The main difference being the versatility of the Crux Prime. The Sure Lock was a heavy oil specific ball for me. Too strong for any house shot conditions I would see. The Crux Prime's versatility gives me the ability to use it on a medium oil house shot on both wood and synthetic lane surfaces. Shape---I expected a midlane, smooth reaction/shape from the Prime. But after a couple games I noticed this was going a couple feet longer than the Sure Lock with more angle in the back. For me it looks like a stronger version of the Physix shape. This piece will be my go to starting ball for heavy oil. Something a little stronger than my trusty Physix is what I was looking for and it looks like this will do it!! I really liked the Crux series, especially the Alpha, so I was ready for the Prime. For me the Crux Prime is the perfect update in the Crux series. The Alpha was a little strong and slow for me, I needed something a touch cleaner and more on the backend. The Crux Prime is PERFECT for that. The SPEC cover does roll like a solid but it gives me backend and angle I never thought I could get with a solid. I have no trouble using in during a set. It’s early smooth enough that I can throw it on the fresh but it’s definitely got enough backend for me to use it later in a league session. If you’re a fan of the Crux series, this on is a no brainer.